Medical drama Call the Midwife has been renewed for two more series, the BBC has confirmed. The award-winning drama, which follows a group of midwives in London's East End in the 1960s, will now be on air until at least 2022. The previously announced series nine will start filming shortly, the BBC said. Series 10 and 11 will contain eight episodes as well as the usual Christmas specials. Heidi Thomas, creator, writer and executive producer of the series, said: "Even after all these years, it still feels as though Call the Midwife has more truth to tell, more tears to cry, more life to celebrate, and more love to give. "We are blessed with the best cast, crew and audience a show could wish for and I could not be more excited about our future." Charlotte Moore, director of BBC content, said the corporation was "delighted" to have extended "such a very special show". 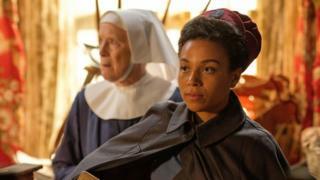 Call the Midwife has won plaudits for tackling such issues as female genital mutilation, cleft lips and palates and sickle cell disease. Last year's festive special ended up the most watched programme overall on Christmas Day, once on-demand figures were taken in to account. ITV also confirmed the Inspector Morse prequel, Endeavour starring Shaun Evans, would be returning, as the sixth series came to an end on Sunday. In addition, Brenda Blethyn will return as DCI Vera Stanhope for a 10th series of ITV's Vera in 2020.